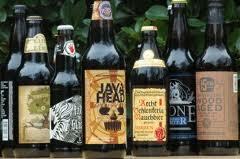 Can craft brewers please stop with the bombers and 750s of strong beers? Why is it that the same brewery will put their pale ale in 12 oz bottles while their barleywine goes into bombers? Why would I want a beer with a higher alcohol content to come in a larger serving size? When I’m bottling I use the big bottles for session beers, while I save my 12 oz bottles for strong beers with just a handful of bigger bottles for sharing. I know that some people like bigger bottles for homebrewing because it means fewer bottles to clean, sanitize, fill, and cap. If breweries passed on the savings they got from using fewer bottles/labels/caps etc… I would have less of a complaint. Instead of seeing a per ounce savings the large format bottles are often more than twice as expensive as their smaller counterparts. Here are some examples of 12 oz versus 22 oz bottle prices from one of the local beercentric stores: Hop Rod Rye $2.59 ($.22/oz) vs. $5.49 ($.25/oz), Lagunitas Maximus $2.39 ($.20/oz) vs. $5.99 ($.27/oz), and shockingly Rogue Dead Guy is $2.99 ($.25/oz) vs. $7.99 ($.36/oz)… almost a 50% premium on the beer in the bomber! I think some of it is psychological, for some reason I think a $4 bomber is a good deal, even though that works out to a $13 six-pack (and a somewhat pricey $10 bomber is the equivalent of an outrageous sounding $32.72 six-pack). The weird thing is that this seems to be a craft beer issue that doesn’t happen with the big breweries. For example Kirin also comes in 12 oz and 22 oz bottles, for $1.99 ($.17/oz) vs. $2.99 ($.14/oz). Same goes for Budweiser: 12 oz $1.39 ($.12/oz), 24 oz $2.29 ($.10/oz), 32 oz $2.69 ($.08/oz). That is the way the price structure should work, you should get a discount for buying beer in bigger bottles not a penalty. I understand that this is not necessarily the case when buying special release larger packaging (magnum or larger) since they require more labor, but if they have a bottling line there shouldn’t be any difference.